Heading to the GoPro Motorplex in Mooresville, North Carolina for the April 11-13 weekend, Anthony Gangi Jr. would set out to challenge himself during the United States Pro Kart Series (USPKS) season opener. Choosing to forgo qualifying both days, starting his wheel-to-wheel action from last place on the grid, the young gun would need to power through the field to vie for race wins. 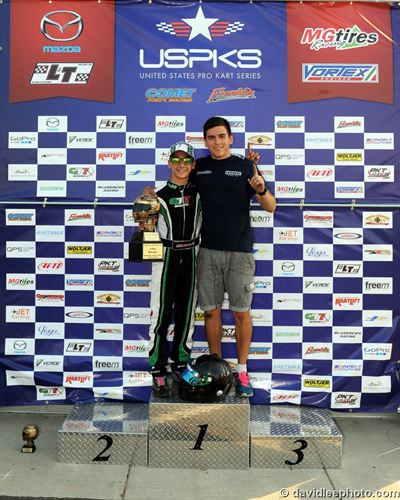 The challenge ultimately paid off big time for the GT7 Motorsports pilot, as Gangi Jr. would top the blocks Sunday for his first USPKS Leopard Junior victory. "This weekend was different to say the least," explained Anthony Gangi Sr. "Jr. decided to mentally challenge himself by making the decision to risk both wins, and a possible shot at the championship, by trying to win a national level race against some of the top drivers in the country coming from the back." After sitting out Saturday's qualifying session, Gangi Jr. would start both of the day's heats from the last position on the grid. Battling his way to tenth in heat one, an incident in heat two for the Tony Kart pilot resulted in a red flag. Out of the race, the Tony Kart driver would start the main event from the 16th place. Working his way through the Leopard Junior field, Gangi Jr. would earn a podium result with his fourth place finish. Sunday again saw the rising talent forgo qualifying. Finishing 16th and 11th in the two heats, Gangi Jr. would line up 13th on the grid for the final race of the weekend. Making his way up to the lead pack with five laps to go, Gangi Jr. picked off a few more karts as he worked into third. As the lead duo fought for position, the multi-time champion steered his GT7/Woltjer powered Tony Kart into the lead and drove off with the day's victory. "His reason to skip qualifying both days was to see if he could be emotionally disciplined with his race craft while still being consistently fast enough to win," continued Gangi Sr. "Forcing himself to not overdrive or succumb under the pressure of getting through the back of the field was a good exercise for Jr. in Mooresville. Knowing he had to gain substantial positions in both heats in order to have a chance at the win on either day in the final was mentally tough, and I am so proud he was able to pull it off!" Also working with new tuner and driver coach Thomas Silva this weekend, Gangi Jr. was able to have Silva's full support of this tough decision during their first race together. Keeping Jr. mentally strong throughout the challenge, Silva also did an outstanding job coaching and tuning Gangi Jr.'s Woltjer powered Tony Kart. Anthony Gangi Jr. would like to thank Team GT7, tuner/driving coach Thomas Silva, Daniel Woltjer for always great power and everyone back at his home track Oakland Valley Race Park (ovrp.net) as well as sponsors GT7 Motorsports, Millwork Solutions, Hole Shot Drive Systems, PKT, and Hot Head Engine Preheaters. The USPKS will resume June 20-22 at the Michiana Raceway Park in South Bend, Indiana. Gangi Jr. will next be on track for the Superkarts! USA (SKUSA) Pro Tour SpringNationals May 2-4 at the Dallas Karting Complex in Caddo Mills, Texas.